Ruth asks Phil what they'd do if they weren't fighting all the time. Phil kisses her. Lance comes in and sees them. Lou falls in the swimming pool. He says Harold pushed him in! Malcolm slips in the pub and a shelf lands on his neck. 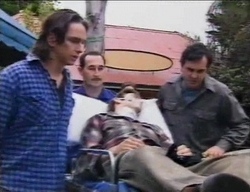 Karl calls for an ambulance as Malcolm struggles to breathe. Karl thinks Malcolm has a crushed windpipe. 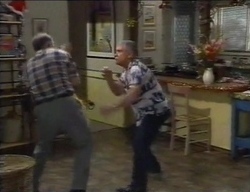 Darren panics as Karl looks helplessly at Malcolm. Malcolm struggles - he can't breathe. Karl tells Darren to get him a sharp knife so he can do an emergency trachaeotomy. Lou comes in to change. He is still ranting at Harold and tries to settle things with a fight. Malcolm loses conciousness. Karl asks Darren to get him a straw. He does the trachaeotomy and encourages Mal to breathe normally. It works, but Malcolm is still unconscious. In the background, we hear ambulance sirens. Madge has to separate Harold and Lou. She tells Lou to get dry and go home - she doesn't want him at the party anymore. Ruth skulks in to find Lance playing a video game. Lance is very frosty about the situation with Phil. He tells Ruth crossly that her relationship with Phil is none of his business, but he's clearly upset. The ambulance men are putting Malcolm in the ambulance. 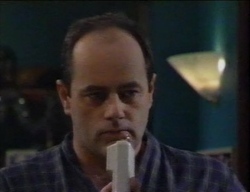 Karl asks Darren to go and tell Susan what's happened. He asks Darren if he's alright to drive. 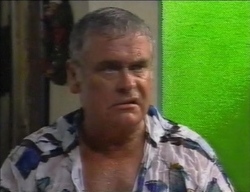 Darren tells Karl awkardly that he did good work in the pub with Mal. Harold is upset about the fight with Lou but Madge thinks he and Lou should settle their differences. Phil comes in dressed as Santa calling "Ho, ho, ho". Susan can't understand where Malcolm and Karl have got to. Ruth comes in and tells "Santa" that Lance is being a bit distant. Phil says the last thing he wants to do is cause trouble between Ruth and her kids. Darren arrives and tells Susan there's been an accident. They head off to the hospital. 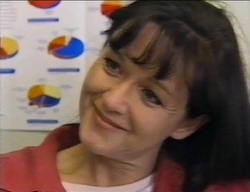 Susan runs into the hospital in a state of panic, but Karl is there and tells her that Mal is fine - he regained consciousness in the ambulance and he's breathing normally. 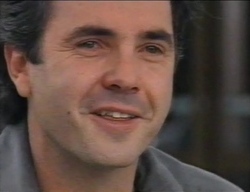 The hospital doctor comes out and tells them that Mal will be alright. Susan asks tearfully if there's any risk of brain damage. The doctor doesn't think so though and tells Karl that he saved Malcolm's life. Karl looks very shaken and goes out to get some air. Susan thinks about joining Karl outside. She makes it to the door but changes her mind and goes back in. Lance tells Hannah that he's off to the skate ramp. Before he does, he tells her that he saw Phil and Ruth kissing in a full-on romantic kind of way. 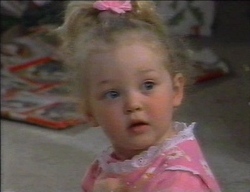 Hannah is a bit surprised - she thought Ruth got on Phil's nerves. 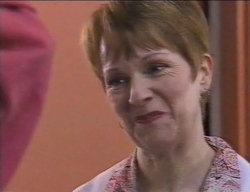 She's quite pleased about it though, and tells Lance if Phil and Ruth got married, they'd be brother and sister. Lance is not pleased at this line of thinking(!) and tells Hannah not to freak him out. He heads of to the skate park. Phil wants to have a talk with Ruth - the kiss came as a surprise to him, as well as Lance. Phil says that things won't be easy if Lance is against them - they need to figure out what to do. Phil suggests that they go out for dinner tonight to talk about it and she agrees. Darren is feeling guilty about the accident - he and Mal were mucking around. He heads off to go and find Libby to tell her. Susan strokes Mal's head and says she can't imagine what he's been through. Then she strokes Karl's face and says he's been through a lot too. Karl says he was terrified at operating on his own son. KARL: The first thing I thought of was, 'What if I make a mistake?'. He says he then went on to automatic pilot and just did it. For the first time in a long time he felt like a doctor again. It felt good. Susan hugs him. 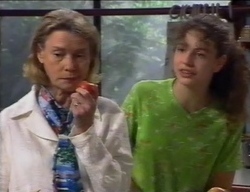 Debbie comes in and Hannah tells her about the pash. Phil tells them all to calm down - he and Ruth are not an item. HANNAH: But you want to be, right?! Phil says it's nobody's business but his and Ruth's! Ruth has made Lance's favourite dinner. Lance has calmed down a bit and Ruth says she wants to discuss the kiss with Phil. She says it wasn't planned - it was spontaneous. She admits she is keen on Phil though. Lance says he supposes he is OK with it. Ruth says that of course the family will always come first. Lance says he acted like a jerk before - he'll go along with whatever Ruth decides. Lance suggests that they have a video night, but Ruth says she's meeting Phil for dinner. He isn't pleased, saying Ruth couldn't care less what Anne and Lance think. Darren has brought Karl the keys to the ute back. There's an awkward atmosphere between them. Darren is still shaken by watching Mal fighting for his life. He tells Karl he was great - he didn't panic or hesitate. KARL: It's the difference between life and death, you know. Sometimes you get lucky. DARREN: And sometimes you don't. Darren says that now he can understand what it was like when Cheryl had her accident. Karl must have been under a lot of pressure and he did the best he could. Karl thanks him and shakes his hand. Then he offers him a beer which he gratefully accepts. Lou is apologising to Harold, but doesn't look like he really wants to(!) Lou says he is willing to put their thirty-odd years(!) of bickering behind them and be mates if Harold is. HAROLD: We wouldn't have to be the BEST of mates or anything, would we? LOU: Oh, good heavens, no. 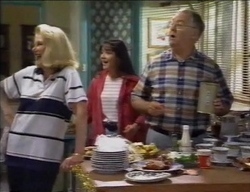 Lou suggests a game of cards - himself, Harold, Madge and Marlene. Harold isn't very keen, but Lou says that Madge will like the idea. Phil and Ruth are having a chat. Ruth says maybe it would be better if they didn't see each other in a romantic sense. She says that Lance can't cope with the idea of she and Phil being together. She asks Phil not to take it personally. RUTH: Who says that what happened between us wasn't just some fleeting moment of Christmas cheer? PHIL: Guess we'll never know. They drink a toast to friendship. Lou and Harold come in to tell Madge the good news - they've decided to stop fighting. Also that Lou wants them to have a card game tomorrow afternoon. Madge is a bit perplexed at this turn of events. Ruth is home early, much to Lance's surprise. 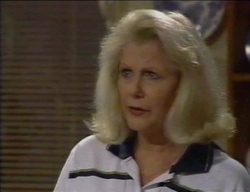 She tells Lance that nothing is going to happen between her and Phil - they've decided they're better off as friends. LANCE: Bit of a bummer it didn't work out. But at least we can go back to being a family now. Just the three of us. RUTH: Just the three of us. Lance asks Ruth if she really did like Phil - he didn't mean what he said about her not caring what they thought. Ruth doesn't say anything and goes off for a bath. Ruth answers the phone, but in a shot of the Martin's house, Phil hangs up just as she does. They both look fed up.